Today I wished to share an example of contemporary vestment work that I believe demonstrates how much good can be accomplished with little good taste and something noble to work with. Put another way, with a good eye for materials and design, you can make an awful lot from only a very little. This might seem counter-intuitive as there can be a tendency in our day to think that what must be good must somehow complicated or flashy -- though we don't call it that nor recognize it as such of course. No doubt this is a response to the minimalist aesthetic that had invaded both Church and society from around the mid-20th century onward; with it came a thirst for ornament but the end result in our time has frequently been little more than designs based upon an overly-exuberant (and not entirely convincing) 'metallic' gold brocades. This, perhaps, may not sound so very bad, but it is when you consider that the end result has not been dissimilar to the difference between true fashion and that which would parody it, namely the flashy glitz found on countless stages of Broadway and Las Vegas. The first point of note here is the the very beautiful shade of Roman purple which has been selected. This reddish shade of purple works very nicely with the gold braid that has been paired with it. 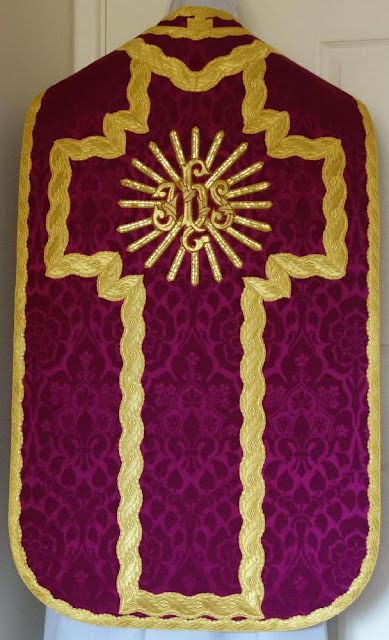 Second, the pattern found within the violet harmonizes extraordinary nicely with the wave of the gold braid. 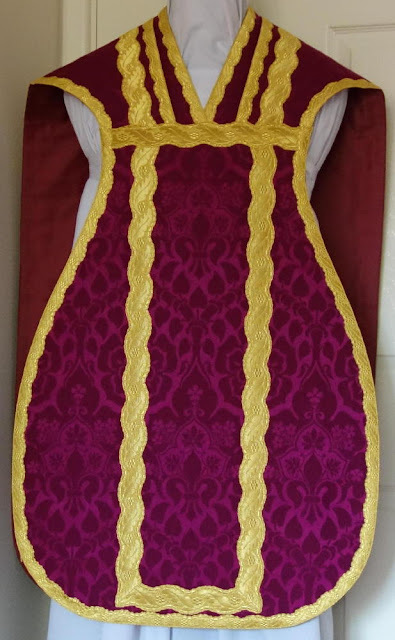 As you pull the vestment into its different component parts, you see that what you have are couple of very basic elements, but as they are beautiful in their own right and well paired, the end result is simple, straightforward and noble.